Harrison-Clapton 1957 Les Paul Standard Lucy - Cherry Red, LP-Shaped Guitar from Gibson in the Custom Shop Les Paul series. 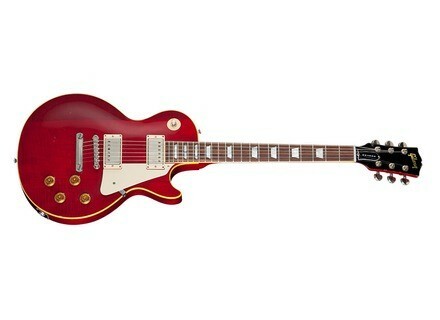 The Gibson Custom Shop has recreated the 1957 Les Paul Standard "Lucy" guitar used by George Harrison and Eric Clapton. Gibson announces a price of $22 235 (MSRP). You'll find more details about the story of Lucy at www.gibson.com. AMT introduces the TPA-50 amplifier Russian manufacturer AMT Electronics adds to its guitar product catalog the TPA-50 power amplifier equipped with SolidState tubes. Orange OR15 Review Every day that goes by it is more obvious that the famous Orange Tiny Terror turned the guitar amplification market upside down. It started a trend (a very positive one, if you ask me) for affordable, high-quality and low-power amps. In spite of the huge number of products in this segment, Orange is still the leading player when it comes to low-power tube amps. VFE uses KickStarter to launch new effect pedals VFE Pedals is currently updating some of his guitar effect pedals and launches a campaign on Kickstarter to get funds.